When you receive a set of designs from Graceful Embroidery you will always find a PDF of instructions, design images and details within the zip folder. This is an essential read as it is full of important information like the threads I have used. The choice of colours is crucial to the look of the embroidery when it is finished. I take a great deal of time selecting the very best shades that will work well together so if it is possible I recommend that you use the same ones. 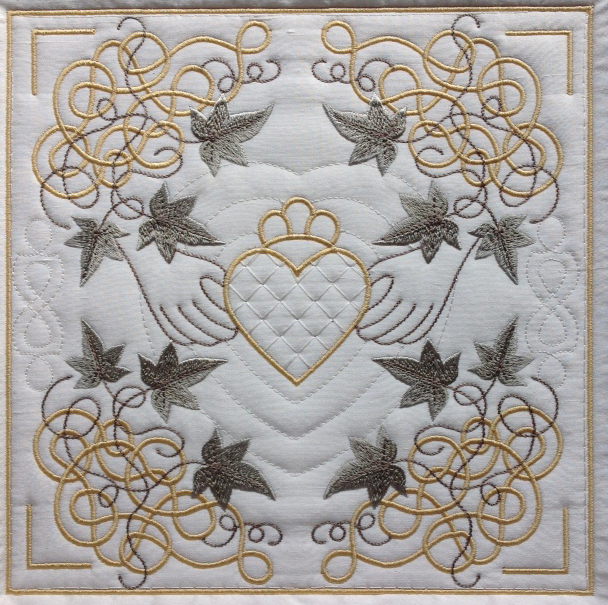 Here is a close up of one of my favourite designs in the Celtic Iv Quilt Blocks showing the detail of the hearts and some of the quilting stitches. I changed the colours for this particular stitch out, muting them slightly. The results give a more classic look. These alternative colours will be listed in the PDF. My quilt blocks where stitched out on ivory silk dupion and because I layered the stabliser and batting underneath I found there was no need to back the silk. 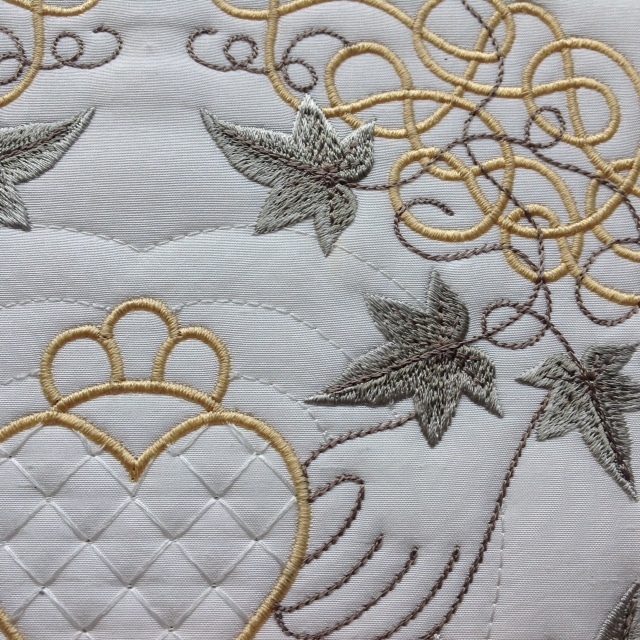 Here is the finished quilt block with heart shaped contours spreading out from the Claddagh. Named after an area near Galway, Ireland, the Claddagh features hands, representing friendship, the heart represents love and the crown loyalty. If you are looking to make a quilt with Irish designs these will make it very unique! There are lots of other designs to choose from, some very detailed and other more open. Some of the quilting stitches can be eliminate for a softer look. I suggest that you slow your machine down when you stitch the leaves and give your bobbin area a good clean after you have finished as the batting creates excess fluff. Celtic Ivy Quilt blocks 2 will be released on Monday 27th October, 2o14! Can’t wait! Just wish I’d known that I was going to have to purchase another machine when the first set was on pre-order so I could have gotten it too. Remember, I thought I had ordered it by mistake but it didn’t go through. Maybe that was prophetic or what was to come & I just didn’t see it at the time, oh my! Lovely, gorgeous, & many more adjectives, your work is outstanding! Thanks so much for sharing!